The bloodiest fight in NHL history wasn't on the ice. Ted Lindsay: What bylaws? I've been in the league for 12 years I've never seen no bylaws! Milton Mound: May I see them please? Milton Mound: How can a bylaw be confidential? Conn Smythe: Only the governors are privy to them. It says so right here in the bylaws. Milton Mound: Well you show me where it says that. Conn Smythe: You're prohibited from seeing the bylaws. It says so in the bylaw! A hockey-mentary film about a time when sports stars made less money than the average fan. Who better to make a docu-drama about hockey's early history than the Canadian Broadcasting Corporation who were covering hockey at the time of this story's setting. The story is about Jack Adams, the penny pinching hockey owner played by Al Waxman. 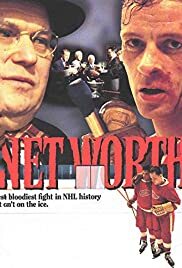 Adams's scoring star Gordie Howe(played by Kevin Conway who fits the role of Mr. Hockey)is willing to work for peanuts but his tough guy Ted Lindsay(Aidan Devine)feels the hockey players need to form a union to get what they deserve. The film also has familiar Canadian actors Billy Van, Richard Donat and R.H. Thomson who has made a living starring in TV movies about Canadian heroes("Samuel Lount", Charlie Grant", "Hal C. Banks", "Terry Fox", "Frederick Banting"). The plot has the predictable highs and lows as Lindsay gets moved out of town and Howe provides the voice of reason. The film ends with a look at some hockey stars of lore that spent their later years in poverty. While it's hard to sympathize with the NHL Players Association today with the average player salary well over $1 million a year, it's interesting to see how far they have come thanks to people like Ted Lindsay who fought bravely for players' rights at a time when any talk of union branded you a communist and a traitor.